Grand Rapids, Michigan – February 21, 2019 – The Wege Foundation (www.wegefoundation.org) will host the 23rd Wege Speaker Series (www.wegespeakerseries.com) on Thursday, April 11 at 4pm at the Aquinas College Performing Arts Center. 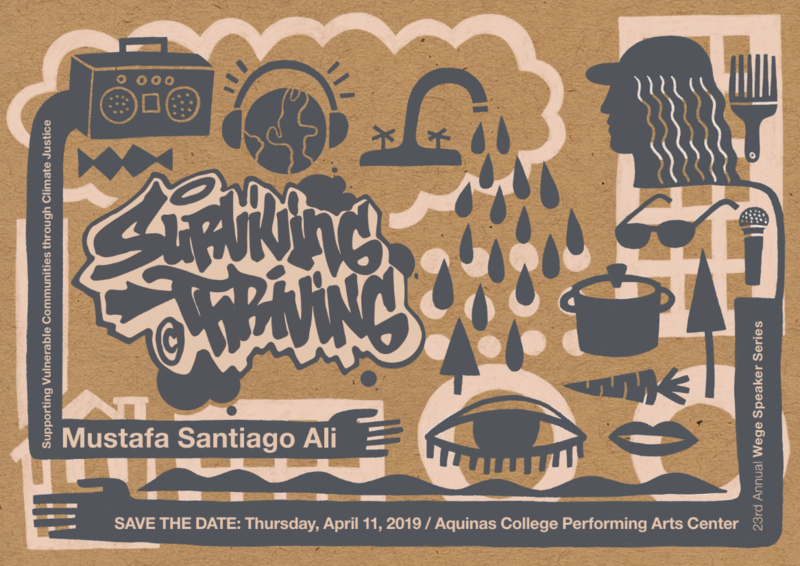 This year’s speaker is Dr. Mustafa Santiago Ali, Senior Vice President of Climate, Environmental Justice & Community Revitalization for the Hip Hop Caucus and former leader at the U.S. Environmental Protection Agency. 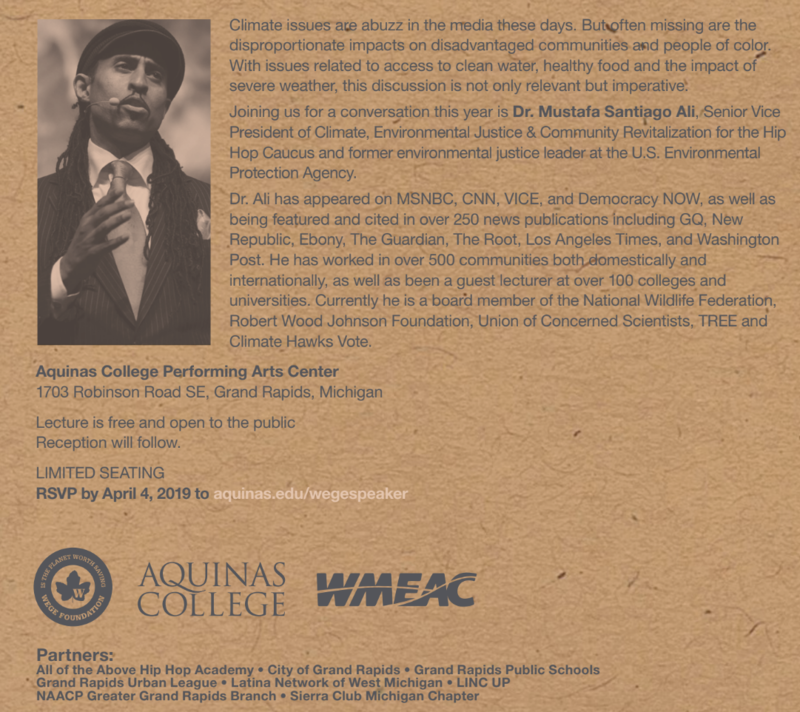 He will present about how to elevate environmental justice issues and strengthen environmental justice policies, programs and initiatives. “Ali is one of America’s environmental justice leaders and currently focuses on using the arts in addressing pressing issues such as climate change,” said Mark Van Putten, President of The Wege Foundation. Dr. Ali has appeared on MSNBC, CNN, VICE, and Democracy NOW, as well as being featured and cited in over 250 news publications including GQ, New Republic, Ebony, The Guardian, The Root, Los Angeles Times, and Washington Post. He has worked in over 500 communities both domestically and internationally, as well as been a guest lecturer at over 100 colleges and universities including Howard, Harvard, Yale, George Washington, Georgetown and Spelman. Prior to joining the Hip Hop Caucus, Ali worked 24 years at the U.S. Environmental Protection Agency (EPA). He began working on Social Justice issues at the age of 16 and joined the EPA as a student, becoming a founding member of the EPA’s Office of Environmental Justice (OEJ). Currently he is a board member of the National Wildlife Federation, Robert Wood Johnson Foundation, Union of Concerned Scientists, TREE and Climate Hawks Vote.